First name meaning: (Just for fun; In Greek/Hebrew) "My God is a Vow." Reiatsu and Cero Color: Rose Red. Elizabeth is of average height, with a slim muscular figure, and fair skin. Her "assets" are well developed, while not overly large. Her hair used to be dark brown, and long, reaching far beyond her lower back. Two strands are braided with leather strings to either side of her face. Her eyes are a beautiful rose red. She's almost always wearing a white version of this, without the headpiece (though part of it is still incorporated:). Her mask protrudes from her left ear, in the form of a vestigial wing. Her Hollow hole is located where her heart would be, although it's covered up by her "dress". Espada: Upon becoming an Espada (and other factors), Liz had a new uniform made for her, along the lines of this. She has also had her hair kept moderately short, and as a result of a prank, blond. "…Yes, you could say I believe that. I do not believe myself to be a good person, however… but, I am fine with that. I would willingly stain my hands so that the rest of my family need not… I would willingly throw myself to die in front of my loved ones to die so they need not. One would say… my love defines me. Maybe it's naive, maybe it's misplaced, but… it is there, and I have given it to those that I feel need it." 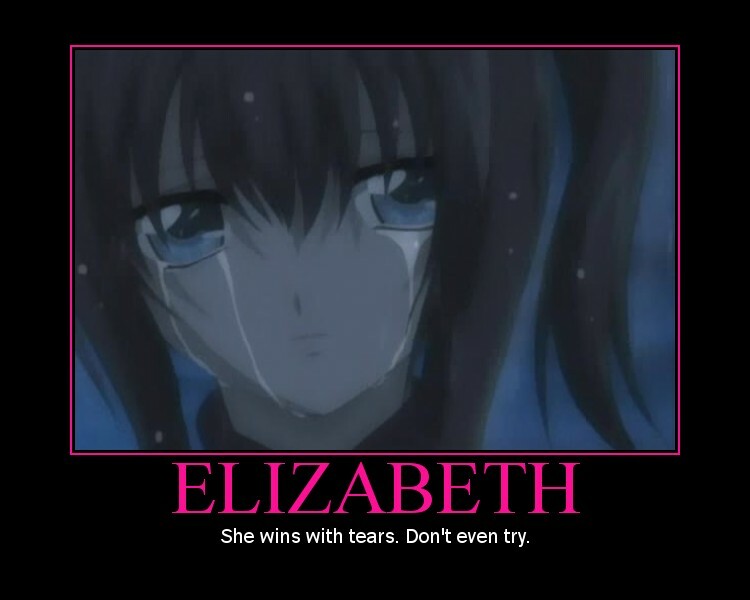 Elizabeth is an extreme idealist, by some miracle of personality, despite all her surroundings and nature. She believes in peace over battle, trust, and honor, and discipline, evidence in the fact that she is very skilled in her swordsmanship. She is almost always acting proper, and stays upright regardless of how she is truly feeling (unless she's bowing in front of Toho). However, in spite of her ideals, she is loyal above all else. And being that Toho created her, her loyalty is sworn to him. She easily regrets her actions, and doesn't agree with all of Toho's decisions, but will do them without question, as she considers Toho and the Arrancar her family, and she would strike their enemies so that none of them would die. When left up to her, she would just as soon try to negotiate with an opponent instead of fight. But if a direct order comes from Toho, she strikes without giving quarter, only wishing to end the fight quickly, though lamenting it to her foe the whole time as they inevitably struggle. Usually unless pressed she will opt to disable an opponent rather than outright kill them. However, if she finds a path that she thinks would likely better suit Toho's needs, she takes it at liberty to choose such a path instead of his direct orders, though such occurances are rare. Vanessa, AKA Valkirie, is the Hollow that consumed Elizabeth, but was overtaken by the former Shinigami when transformed into an Arrancar. She is polar opposite to Liz, hardly showing any emotion or empathy towards most Arrancar, short of rage. She is cunning, manipulative, ambitious, and confident in her ability, showing as many negative sides to the values Liz held. Having witnessed everything Liz has, how she acts, and knowing her thought process, she has no quarrels with acting her part to get ahead. In battle she ends fights quickly and ruthlessly, showing no pretense or hint of mercy. A standard european longsword, with roses engraved into the blade. 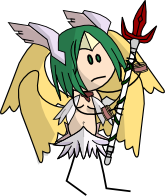 The spirit is a young woman with short green hair, and nearly naked, with wing-like bits of bone material covering her body. She is much more informal than her master. Resurrección: "Descend from Asgard, Frigga!" Elizabeth's mask fraction grows into a visor that covers her eyes, with another vestigial wing covering her right ear. Bone platelets form a breastplate and clawed bracers, and she grows four rose-…or perhaps blood-red (real) feathery wings. Obviously aside from gaining flight, her speed and strength increase exponentially. In addition, bloody rose petals occasionally leak from her wings, exploding into balas if they come in contact with spiritual beings aside from herself. Her longsword is pretty much the same, though its cutting power is increased. Rose Seal: Elizabeth picks a fully-grown rose from one of her wings, and flings it as a projectile at an opponent, easily piercing flesh. Initially, this is the only damage it does, but it quickly grows into the wound, making it hard to extract. Its primary purpose is that it attracts the bala petals that fall from Elizabeth's wings, as well as her normal Cero/Bala, making them harder to dodge at long range, and almost impossible in close quarters. Rose Storm: If Elizabeth focuses on it, she can release a swarm of bala petals that follow her around, making her constant charges with Valkyrie's blade all the more dangerous. Valhalla Halo: As a result of Liz remembering her past, in her resurreccion, she now sports a golden Halo about 5 feet in diameter, that floats behind her at all times. Over time, it gathers spirit particles from the air, which can be transferred into cero, bala, or used to multiply the effects of her own cero/bala. It can be used as an impromptu weapon, as well. Bone armor covers the remainder of Elizabeth's body, providing an almost inpenetrable barrier. She grows an extra pair of wings, and each wing begins to shed bala petals more often. Her left bracer extends to include a buckler, and her longsword changes into a long spear fashioned after the Gungnir of Norse legend. The entirety of it is wrapped in rose vines, that sprout Rose Seals when it strikes foes. When used with Cero, it amplifies the power of the blast by twofold, or more, depending on if she takes time to charge it or not. In this form, her Hollow Hole is visible, forming the only break in her armor, though the hole might as well be for aesthetic means, because her heart is long gone. 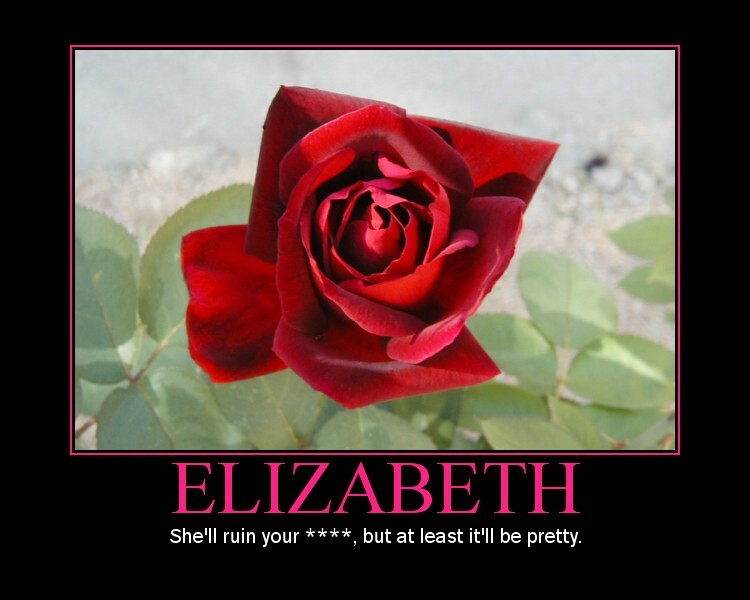 Rose Bush: Elizabeth can stoke the ground with her Gungnir, as well, growing a spiritual rose bush that sheds bala petals. Yggdrasil: Elizabeth throws Gungnir directly into the sky, and it comes back down in the form of a massive tree, that continually sheds bala petals; with the exception that those that touch her allies are healed, to a small degree. Gungnir can obviously not be used in this state. Scourge: A last ditch attack, this is performed by charging a Cero through Gungnir for no less than a minute, then throwing the spear at the intended blast area. Elizabeth's range with the spear is in the range of miles. After impacting ground, it creates a blast comparable to several hundred Cero combined into a nuke, smothering existence of all but nature and creating a Yggdrasil tree (obviously not as massive as in Norse legend) independent of Gungnir in the blast radius. This ability leaves Elizabeth extremely drained afterwards, usually forcing her to withdraw from Segunda Etapa, if not Resurrección altogether. Asgard Halos: In Segunda Etapa, Liz gains two more Halos, which continually gather spirit particles. When all three Halos are lined up, and a cero is fired through, it creates a destructive force that rivals some of the strongest Cero used by Espada. The beam is more focused, and thus moderately easy to dodge; unless, of course, the target has a rose seal placed on them. Elizabeth is a skilled swordsman (or swordswoman) when she gets down to it, using practices from multiple cultures. Normally, she uses any of these stances in battle, switching between them as the situation changes; though she does occasionally use traditional kendo. She avoids using sonido unless strictly necessary, but her normal speed & reaction time are still extremely quick. 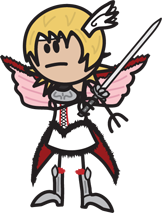 She also rarely uses cero or bala outside of her Resurrección, but she has the ability to funnel them into her sword, making her attacks even more deadly. Her hierro is fairly strong, but not overly so (any captain-level in shikai could easily cut her, and a lieutenant could probably manage to at least nick her). With Liz remembering her past, came a substantial surge of power, boosting the lady Arrancar's Cero/Bala, Hierro, overall strength, and the sharpness of her blade. It is more or less indestructable now, to all but the strongest zanpaktous. In addition, Liz has remembered her knowledge of Kido, mostly her mastery in Bakudo. In either release, her armor is almost as indestructible as her blade. In her unreleased state, Liz can manifest a single pair of her wings, allowing for flight even outside of her Resurrección. Cherry Blossoms - Except with Rose Petals. Lady of War - She's a good fighter, and a lady. Meaningful Name - "My God Is A Vow"
Tender Tears - Liz's tears break people. She was once Captain of the 4th Squad, a well-known swordswoman just as she is now. She was also known for her treatment of all of her subordinates, always one to respect and almost love them as a mother would their children. She was just as valorous, respecful, honor-bound, and as all things, peaceful, if not more, than she is now. She always attempted to find the peaceful solution to a problem. Truly, she was just as well loved then as she was (mostly) among the Espada now. However, she was also tied by duty. Never afraid to defend her Squad Members, nay, any members of the Gotei 13, she often put herself into dangerous positions, just to make sure they got away safely. In fact… that's the reason she is an Arrancar now. One such time, it's rumored she held off several Adjuchas level Hollows to the last breath, just to save an attack squad that was doomed to destruction against an ambush. However… she fell, and was never seen from again. It could only be assumed she was eaten. But, it is obvious by some miracle that her personality gained control when the Hollow that ate her had its mask removed. How this happened is also a mystery. With Helena Von Geister and Sora. Vanessa, or Valkirie, the Hollow who first consumed Liz, took over partway through the fight after Liz had her memories stolen, and combined the three forced Persephone into retreat. Alongside Von Geister. The two combined forced her into retreat, but not before a demonstration of her true power, which between launching her into a rock far away and petrifying her toes, could be considered a draw. Liz was among the assault team sent by Toho to distract the inhabitants of Seireitei while he recovered his zanpaktou from Captain Sigmund Nobel. Her primary opponents were Akako Sasaki and Satoshi Tsukami. The operation was a success, but Liz was knocked out. The first confrontation between Liz and Ruy, when the latter had just had his mask removed. Could technically be considered a win, by K.O., from having half a hallway collapsed on Ruy. However, Takeshi intervened near the end.